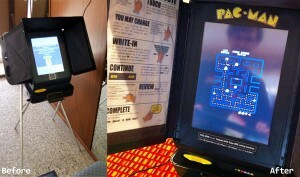 Since the Sequoia AVC EDGE voting machines were known for their insecurities and easy to tamper with, security researchers J. Alex Halderman and Ariel J. Feldman at the University of Michigan decided to turn the useless voting machine into something productive – a fully-playable Pac-Man arcade machine. They managed to reprogram this machine by reformatting the machine’s memory card, and installing DOS and MAME to play Namco’s venerable dot-gobbler. They say they could just have easily gotten it to run Linux. Frankly, I think you should be allowed to play Pac-Man WHILE you vote. Maybe they can get working on that to increase voter turnout.